Juvenile sockeye salmon showing skin hemorrhages as a clinical sign of infection with infectious hematopoietic necrosis virus, or IHNV. Credit: U.S. Geological Survey. 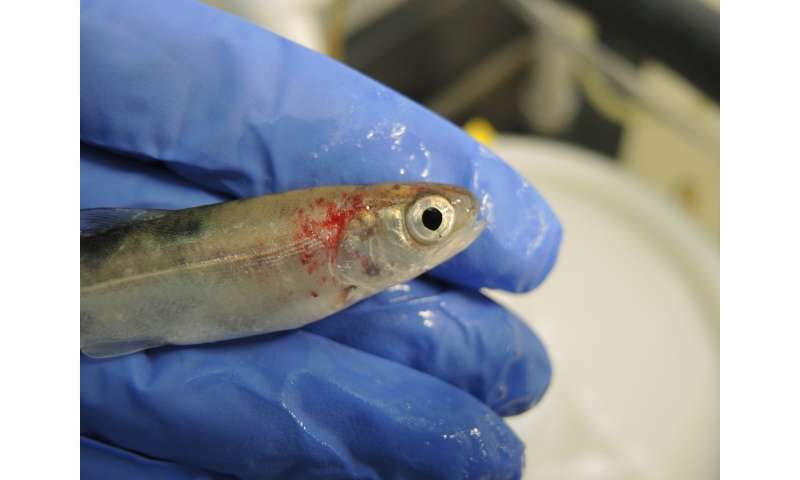 For the first time researchers studying a deadly virus modeled how it spreads to young trout and salmon in the waters of the Columbia River Basin, showing that migrating adult fish are the main source of exposure. The ecological modeling of the infectious hematopoietic necrosis virus, or IHNV, shows how it moves across the landscape over time, providing a crucial understanding for managers of hatchery programs attempting to protect juvenile salmon and trout. "Knowing the relative role of these transmission pathways and probability of infection associated with the different transmission pathways will help managers evaluate what leads to the spread and transmission of this virus," said Dr. Paige Ferguson, assistant professor of biological sciences at The University of Alabama. Ferguson is the lead author on a study published in the June edition of Ecological Modelling that includes contributions from the Cary Institute of Ecosystem Studies, Oregon State University, Cornell University and the United States Geological Survey. In the Pacific Northwest, wild populations of Pacific salmon and trout are critical to the ecosystems, economy and regional culture. State, federal and tribal agencies have hatchery programs alongside the Columbia River and its tributaries that culture fish for release, with the aim of supporting ecosystem health, recreational fishing and commercial fisheries. Steelhead trout and Chinook salmon are the most abundant IHNV-susceptible species in the Columbia River Basin and adjacent coastal rivers. When infected with IHNV, blood-producing tissues deteriorate, which can be deadly to young trout and salmon. Prevention is the current strategy for hatchery managers as there is no treatment for infected fish. An IHNV infection in a hatchery can be devastating with as many as 90 percent of young fish killed. The research group found juvenile fish are exposed primarily by migrating adult fish returning to the river from the Pacific Ocean to lay eggs, shedding the virus as they swim upstream into the water that flows into hatcheries. The model showed migrating adult fish were involved in the exposure to IHNV in 75 percent of cases. In 15 percent of cases, exposure involved the previous generation of young fish at the hatchery, and, in 21 percent of cases, exposure involved juvenile fish in the river. Totals exceed 100 percent because exposure can involve just one or any combination of these three transmission routes. However, the model also showed exposure by the previous generation of young fish at the hatchery is more likely, at 22 percent, to result in infection compared to adult or juvenile fish in the river. Those bring no more than a 17 percent change of infection. "This new transmission model is highly innovative and its application to the complex virus traffic in Pacific salmon has great potential for enhancing our ability to manage viral disease in the Pacific Northwest," said Dr. Gael Kurath, senior research microbiologist with the U.S. Geological Survey Western Fisheries Research Center in Seattle and a coauthor on the paper.